The wooden statue of Amida stands on a lotus pedestal above clouds and is making a blessing with the hands. 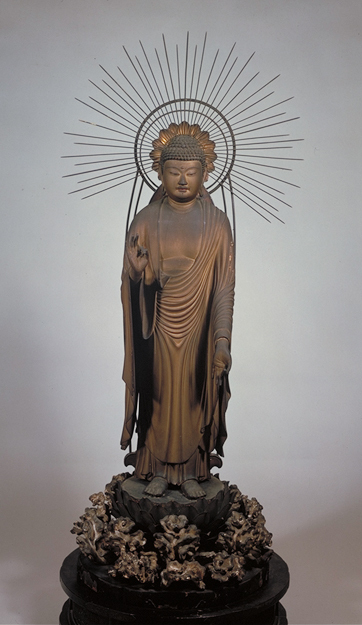 The form of this sculpture is impeccable, elaborate and is greatly influenced by the Kaikei style which Kaikei (a great sculptor of Buddhist images in the Kamakura period) had accomplished. The inscription on the bottom of the statue records the repair work which took place in 1451. It was probably at that time that thick gold was repainted to the body and the pedestal. It is believed that this statue dates back to the early 13th century.